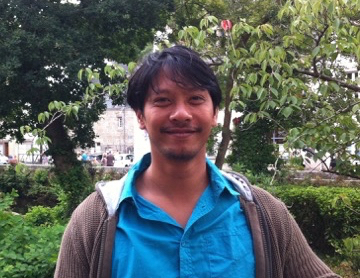 Etera Livine is a CNRS researcher and focuses especially on mathematical aspects of loop quantum gravity and spinfoam path integral models. Etera and Christoph both work on quantum gravity at the Laboratoire de Physique de l’Ecole Normale Supérieure de Lyon (LPENSL) in France. Among the various approaches to the quantum gravity challenge, loop quantum gravity proposes a framework for a canonical quantization of general relativity, describing how the 3d geometry evolves in time. It does not require a priori extra dimensions or supersymmetry. It defines spin network states for the quantum geometry directly at the Planck scale, with a discrete spectra of areas and volumes, and computes their transition amplitudes by path integrals inspired from topological field theory, called spinfoam models. This framework is mathematically rigorous but we nevertheless face one big issue: the coarse-graining of the Planck geometry up to our scale and the cosmological scale and the induced renormalisation flow for the gravitational degrees of freedom. It is necessary to work this out in order to check the microscopic dynamics of the theory and be able to compute consistently the quantum corrections to classical gravity. 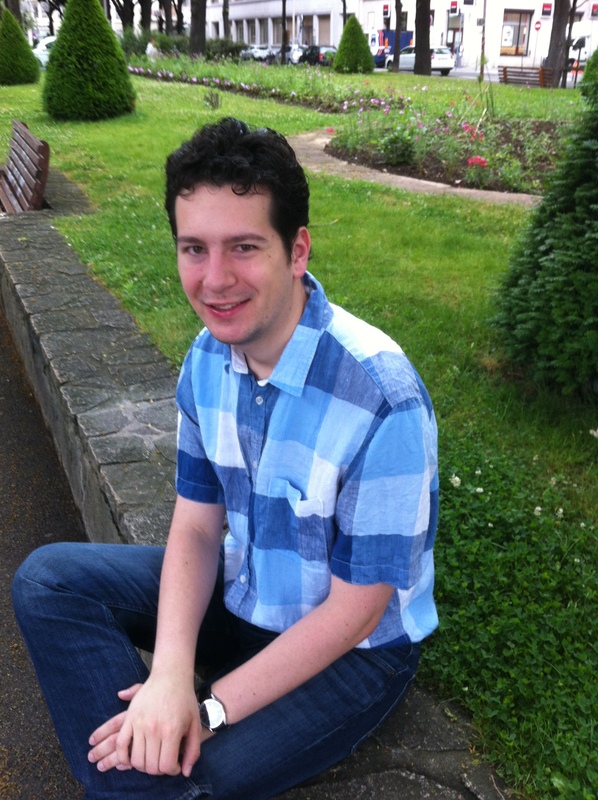 Christoph Charles is working on a PhD thesis about the coarse-graining of loop quantum gravity and its cosmological applications. Etera and Christoph both work on quantum gravity at the Laboratoire de Physique de l’Ecole Normale Supérieure de Lyon (LPENSL) in France. In order to describe the structure of the theory at all length scales, it is essential to understand the geometry defined by the spin network states. These are best interpreted as the quantum version of twisted geometries, as introduced by Freidel and Speziale (arXiv:1001.2748). They generalize Regge triangulations, by allowing torsion on the 3d space slice. But keep in mind that this is the torsion of the Ashtekar-Barbero connection, and not of the spin-connection, and that it represents the extrinsic curvature of the spatial slice within space-time, that is in some sense the “speed” of evolution of the 3d geometry. Twisted geometries are constructed as chunks of space, defined as convex flat polyhedra (embedded in the flat 3-dimensional Euclidean space), glued together as usual through their faces, but merely enforcing a matching of the area of the faces and not of their exact shape. This mismatch encodes the non-vanishing torsion. When coarse-graining loop quantum geometry, we naturally expect non-trivial curvature and torsion to emerge and so we need to look for a generalization of twisted geometries made of curved blocks of geometry glued together. In our CQG paper we investigate the first step of this program, that is how to define the simplest curved hyperbolic polyhedra, that is the hyperbolic tetrahedron, in the natural variables of loop quantum gravity. A flat convex polyhedron, such as a tetrahedron, is fully determined by the normal vectors to its faces, which define its embedding in the flat 3d space. These normals are constrained to sum to 0: this is the flat closure constraint. It is possible to work out a similar definition for a curved tetrahedron, embedded in a 3d hyperboloid, in terms of “curved normals” defined in terms of the parallel transport around each face. The closure constraint is then expressed in terms of the natural group multiplication on SU(2) (unitary matrices) or SB(2) (upper triangular matrices). The simplest case of a constant homogeneous curvature corresponds to a non-trivial cosmological constant Λ≠0. In the context of topological field theories, like for instance Chern-Simons theory or gravity in three space-time dimensions or the so-called BF theories in arbitrary dimensions, the cosmological constant turns into a q-deformation of the gauge group. Following this insight, Girelli and Dupuis and collaborators (arXiv:1402.2323, arXiv:1403.7482) introduce q-deformed twisted geometries, which lead to q-deformed spin networks. Our aim was to understand if those q-deformed twisted geometries could be interpreted geometrically as hyperbolic twisted geometries, that is networks of hyperbolic polyhedra (weakly) glued together. Mathematically, focusing on tetrahedra, a flat tetrahedron are described through Minkowski’s theorem by the normal vectors to its 4 triangular faces. The norm of these vectors give the area of the triangles. These normals sum to 0 by definition, this is called the “closure constraints”. 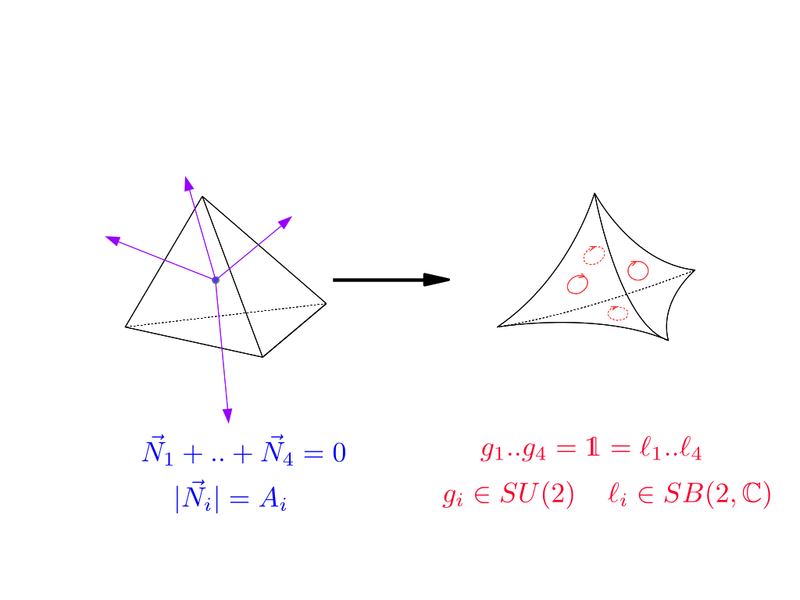 We describe how the normals to a hyperbolic tetrahedron can be defined as SU(2) group elements or as SB(2,C) group elements (roughly Lorentz boosts), instead of the 3-dimensional vectors of the flat case, and how the closure constraints can deformed from the abelian sum of vectors to the corresponding group multiplication. This turns out to be exactly the deformation of the gauge group action of the q-deformed theory. Very similar work by Haggard and collaborators also recently appeared as arXiv:1506.03053. We still have to work out some details, such as the generalization from tetrahedra to arbitrary polyhedra, but we hope that this definition of elementary curved blocks of geometry will be a solid first brick of the larger program of gluing them together consistently in order to define curved twisted geometries and study the coarse-graining of spin network states and loop quantum gravity. This entry was posted in Author Insights, IOPselect and tagged Loop Quantum Gravity, Spinfoam models by Claire Fullarton. Bookmark the permalink.